Did Ben Franklin Say “Beer Is Proof That God Loves Us & Wants Us to Be Happy”? Anchor historian Dave Burkhart debunks the most frequently misquoted and misattributed sayings about beer and San Francisco. We at Anchor Brewing have no doubt of the truth of this statement. But of the author? Well, it simply wasn’t Benjamin Franklin. Wishfully but mistakenly attributed by beer lovers, lecturers, and writers to a man who deserves credit for so much already, it remains one of the most popular sayings about beer—if not God and happiness—that nobody really said. Although he enjoyed beer—especially small beer, perfect for long sessions devoted to discussions of political philosophy, economic theory, science, and the arts—Ben Franklin was first and foremost a great lover of wine. As Franklin reminded Monsieur l’Abbé Morellet in the same letter, “In vino veritas…Truth is in wine.” And truth, according to Morellet’s motto on the bookplates in his vast library, triumphs over all—Veritas omnia vincit. I now began to think of getting a little Money beforehand; and expecting better Work, I left [Samuel] Palmer’s to work at [John] Watts’s near Lincoln’s Inn Fields, a still greater Printing House. Here I continu’d all the rest of my Stay in London [he returned to Philadelphia in 1726]. At my first Admission into this Printing House, I took to working at Press, imagining I felt a Want of the Bodily Exercise I had been us’d to in America, where Presswork is mix’d with Composing. I drank only Water; the other Workmen, near 50 in Number, were great Guzzlers of Beer. On occasion I carried up and down Stairs a large Form of Types in each hand, when others carried but one in both Hands. They wonder’d to see from this and several Instances that the Water-American as they call’d me was stronger than themselves who drank strong Beer. We had an Alehouse Boy who attended always in the House to supply the Workmen. My Companion at the Press, drank every day a Pint before Breakfast, a Pint at Breakfast with his Bread and Cheese; a Pint between Breakfast and Dinner; a Pint at Dinner; a Pint in the Afternoon about Six o’Clock, and another when he had done his Day’s-Work. I thought it a detestable Custom. But it was necessary, he suppos’d, to drink strong Beer that he might be strong to labour. I endeavour’d to convince him that the Bodily Strength afforded by Beer could only be in proportion to the Grain or Flour of the Barley dissolved in the Water of which it was made; that there was more Flour in a Penny-worth of Bread, and therefore if he would eat that with a Pint of Water, it would give him more Strength than a Quart of Beer. He drank on however, and had 4 or 5 Shillings to pay out of his Wages every Saturday Night for that muddling Liquor; an Expence I was free from. And thus these poor Devils keep themselves always under…. Despite Franklin’s feelings about beer, God, of course, still loved him and wanted him to be happy. And forty years later there is proof! 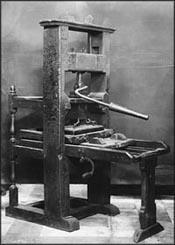 In 1768, Franklin visited the London print shop where he had once been a journeyman printer. 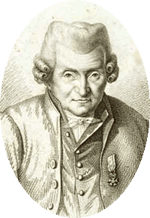 He was sure that one of their presses was the very press that he had operated over forty years before. That was cause for celebration, and he ordered a gallon of porter to share with his fellow printers and toast their noble profession. So—unless you see lightning—raise an Anchor Porter to Ben Franklin and be happy! 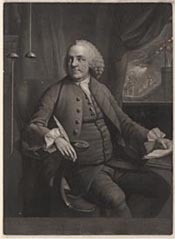 2From Franklin’s autobiography in The Papers of Benjamin Franklin, a joint project of Yale University Library and the American Philosophical Society.